I've gotta tell you a little story. So, before Ryan and I got engaged, we went to a jewelry store in the mall to get my finger sized. The associate helping us could tell that we weren't actually going to buy anything there so she was less than thrilled to be assisting us. She chucked a couple sizers on my finger and quickly said "5". 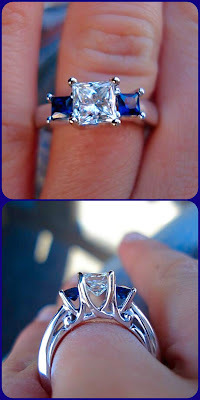 Well, when Ryan had my ring made (I had a little help in designing it; two sapphires, since both of us are Virgos, and a diamond in the center, signifying the two of us becoming one), he went off what she said - I mean, why wouldn't he? Come to find out, my finger is a 3.5. Yup, I've got tiny fingers. Not only is that finger NOT a 5, but because it is a prong setting, when you resize the ring, the stones could get loose and fall out because the prongs may be stretched opened during the process. We looked into getting the stones reset, but the cost was so crazy that we could buy a new ring for that... So, that's what we did. My original engagement ring and wedding band are currently in our lockbox. Don't get me wrong, I love the ring, but it doesn't fit my finger... or necessarily my lifestyle. 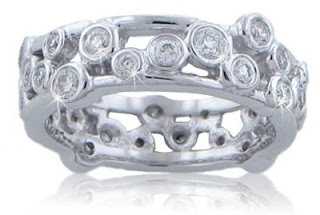 The new ring I got (about 5 or so Christmases ago) is just a band (I think it's considered an eternity band, but I am so not hip when it comes to jewelry or girly things I'm not 100% sure). Seeing as I am always on the go and have an active lifestyle, I thought it fit me better (and it came in a size 3.5 - WINNER WINNER FAKE CHICKEN DINNER). A couple of the diamonds have since fallen out (GRRRRRR), reminding me once again why I can't (or shouldn't) have nice things. So when I started seeing friends with silicone wedding bands I was intrigued. Not only did they look comfy and colorful, they seemed perfect for an active lifestyle (whether that's lifting weights, biking, running, surfing, rock climbing, etc). 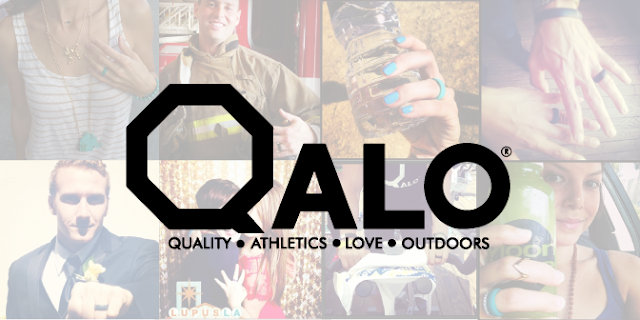 When researching different brands, QALO stood out to me amongst all of the others. Right off the bat, I love the different color options they offer (because, first and foremost, it's gotta be cute, right?!). Next, they are a "local" company - just up the street in Orange, CA. But I also love what the company stands for. 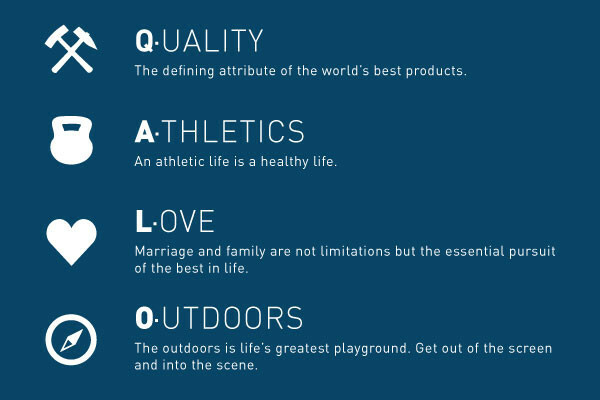 Like literally QALO stands for Quality Athletics Love Outdoors. I also love that they have an option for customization. They consider it a Call Sign. A Call Sign is a unique identifier used to represent a transmission or group. It is intended to be a “secret” communication tool understood only by the members of a specific collection or group. The QALO Call Sign allows couples to use our new customization feature to create their own “Call Signs” with their significant other. 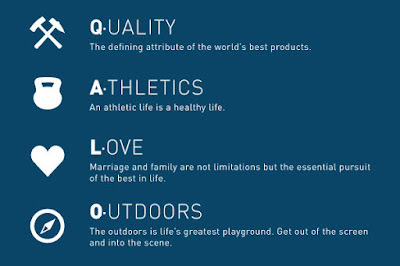 QALO offers four collections of rings; Quality Athletics Love Outdoors (déjà vu anyone?!). My favorite being OUTDOORS. 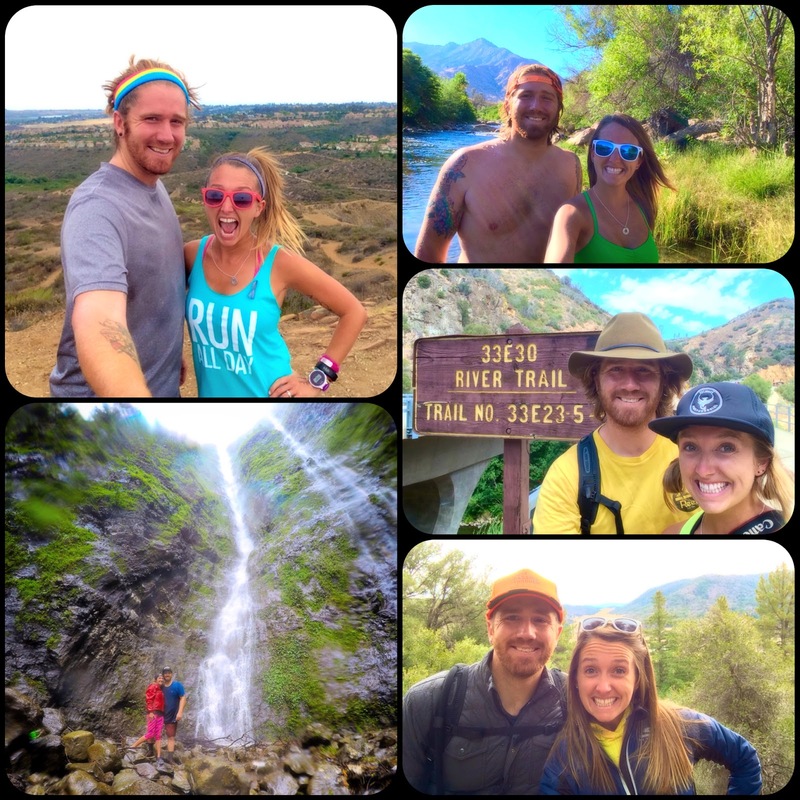 If you follow me on social media, you know that the hubby and I love going on adventures of all types. We love enjoying the great outdoors together! 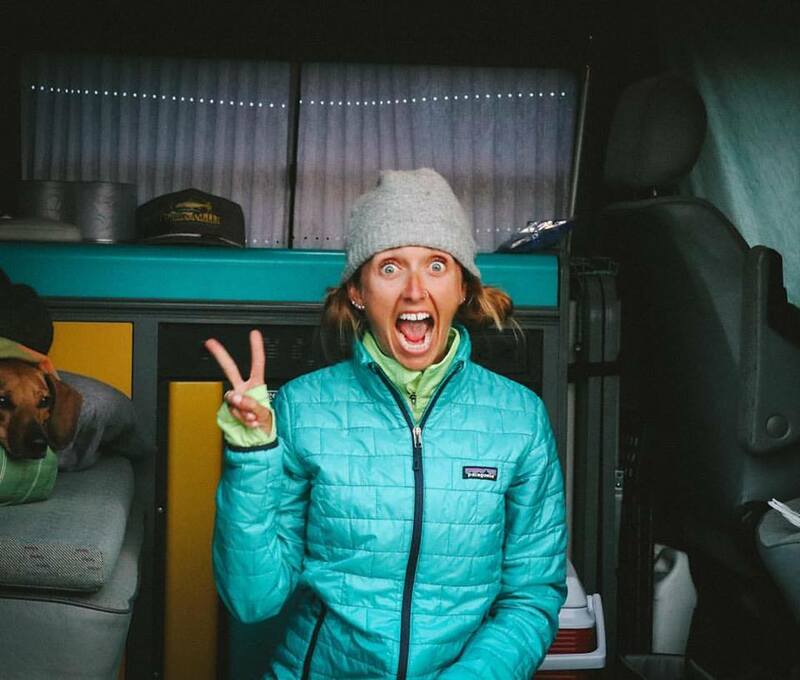 For goodness sakes, we bought a truck so we could build the back out and have an Adventuremobile for all of our travels! 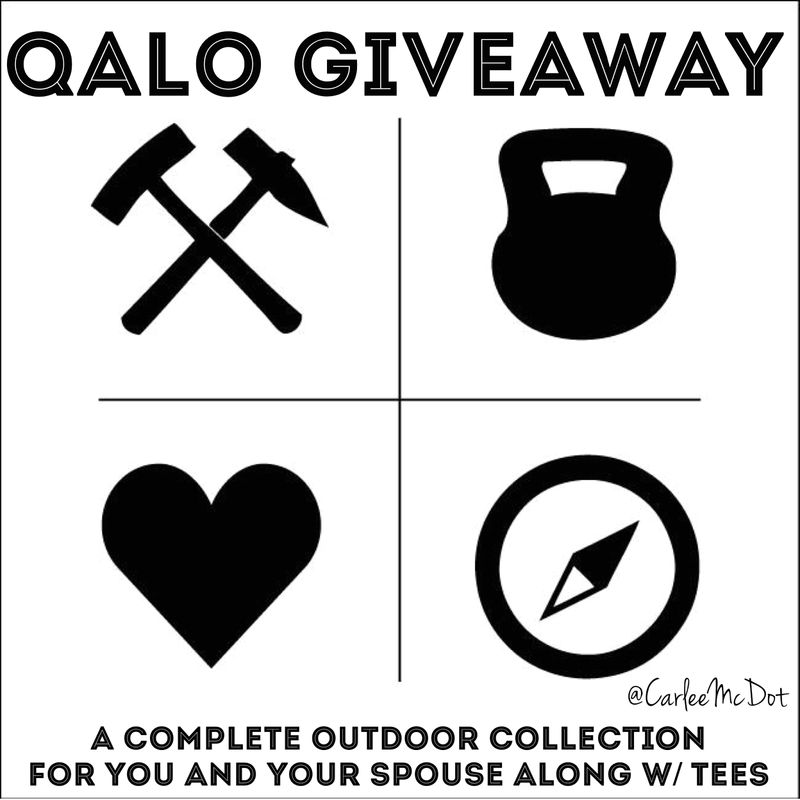 And because the folks at QALO are just so FREAKIN' AWESOME, they are offering up the full collection of Outdoors Rings for you AND YOUR SPOUSE, as well as an Outdoors tee for the two of you! I mean, and it is just in time for Valentine's Day, so the timing could not be any more perfect, right?! 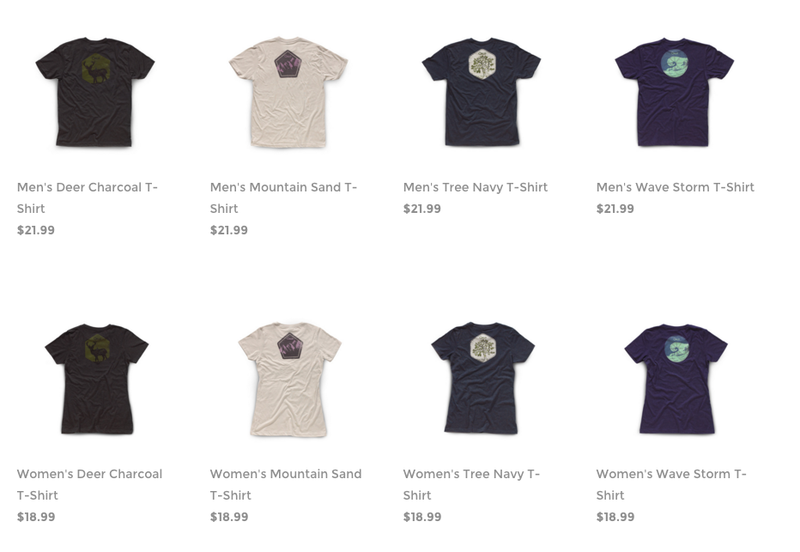 Just in case you aren't the lucky winner, you can use THIS LINK to save $5 on your next order... So I guess that means EVERYONE is a winner, right?! This giveaway will run through February 14th at 11:59pm. The winner will be contacted via the email address associated with their Rafflecopter account and will have 24 hours to claim their prizes. All entries are verified, so please be sure to complete them or a new, random winner will be selected. Our wedding Anniversary is 1/19 and we just celebrated our 8th at a runDisney weekend. What an AMAZING idea! I would never wear my ring running because a) I would be teMy fingers swell up when I run sometimes. June 7 2014 :D My husband has a Qalo *the third wedding ring I have purchased for him! * and I would love to have one as well! We are getting married on March 19 this year! Less than 50 days. We would LOVE to wear these rings on our adventure filled honeymoon in Belize, where we'll be hiking, scuba diving, zip-lining, cave tubing and having a blast. I'm not married yet, but certainly hope to be in the future! This is such a fun ring and so functional as well! May 22 and this is awesome! Our anniversary is March 30th. This year will make 8 years of marriage. June 14th ... Happy Flag Day! June 29th! This would be perfect! Hubby recently lost his ring at a job site. He really shouldn't have been wearing it as it was too big. Rachel and I just celebrated 9 years on January 27. You know we love to run together. 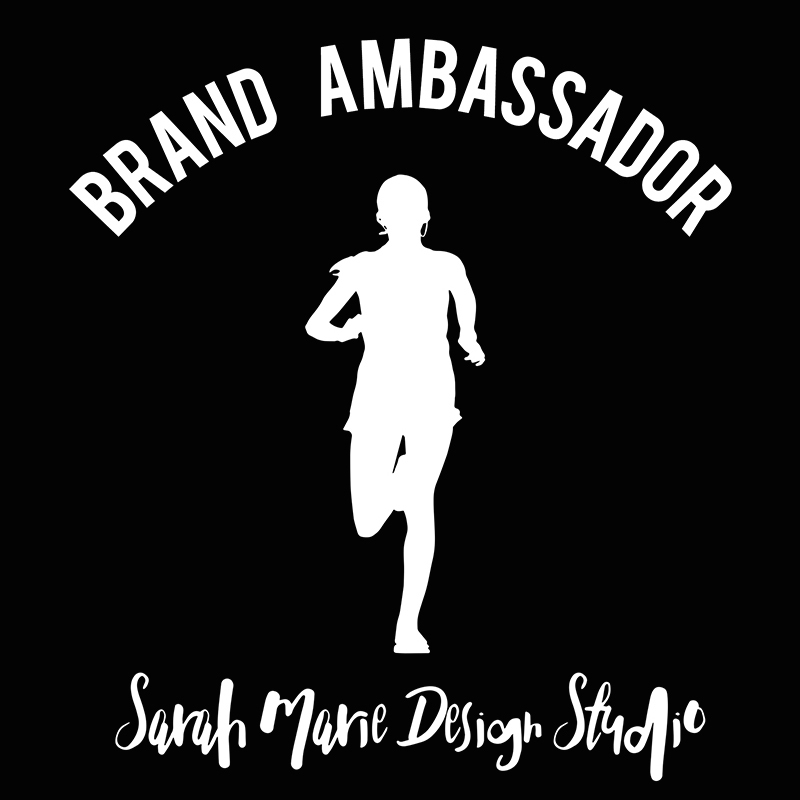 These would be a great to wear as we run together! We got married on August 14 which is also our first date anniversary! 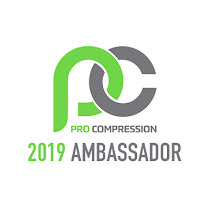 This is a great idea of a product! (Especially since I don't wear my rings when I run.) Our anniversary is January 6. I've actually seen physical therapists wearing these (and planned on getting one for when I am a PT) because they are always using their hands on patients and using a lot of lotions! 7/12!! These rings would be amazing! Our anniversary is October 23, our honeymoon was spent running the Goofy challenge! Our anniversary is July 29th. It will be 11 years, somehow -- time flies! Wedding anniversary is Oct. 16 (married since 1999). I have 1 QALO already and bought one for my husband for Christmas. Would love to have another as the one I have is now a little too big and can come off (especially after I put on lotion, etc.). Love love love this product - I never even put on my original ring anymore, as my QALO is so very comfortable! Our anniversary is May 1! Celebrating 6 years this year! We have been eyeing these rings, my husband has a family heirloom ring, that we are always so nervous about him losing or wrecking! Those Silicon rings are so cool!! Now I want one... but not married, so no need for one! Our wedding anniversary will be 5/21/2016! And we just bought a set of these for the honeymoon! I feel ya on the small fingers, I'm a 4.5! 11-16 (2001) My husband and I almost got these last year. Our anniversary is August 24th. Ironically my husband brought up the idea of the silicone bands recently~ he is an avid hunter, rancher & works outdoors with his hands in the summer months at work and I spend my time running, in a pool or on a biking. He's nervous he'll lose a finger and I'll simply lose my ring! We'd be ecstatic to WIN these bands!! We're not married, but have been dating almost 8 years! Our anniversary is June 18! June 19, 2010. We got engaged in cinderellas castle and he had my ring in his pocket through magic kingdom ALL DAY! Our wedding anniversary is January 27, 2007 - and we celebrated at the Disney Marathon Weekend! Our dating anniversary is June 1. We will be getting married on June 11th. This would be perfect for us! Oh my gosh! Henri and I were just talking about getting these! Would love to win! August 23rd. It'll be 8 years this year. These would be perfect! These are awesome. I've been thinking about one for a while now. My wife and I got married on 11/30 and recently celebrated 13 years! Both of us are active, and my ring just isn't comfortable for working out. Our anniversary is on March 9th. It will be 15 years this year. Sept 9th! I have been interested in these rings for a long time but never knew much about them! Thanks for sharing this and for the awesome giveaway! We met on 4-21-12 on our Appalachian Trail thru hikes, at the 400-mile mark. I love that these rings are something I can wear on a long hike and not have to worry about losing or damaging! Small fingers unite! (I wear a size 4 ring and nothing is ever worth buying/setting at that size!) It seems like every time we attempt to get a ring made or set at that size you lose so much of the character. Our wedding anniversary is July 21st and as an avid runner myself and having a baseball player as a husband, we wish we could wear our rings 24/7! With a combination of marathon training and the risk of the ball hitting my husbands ring, these rings would be perfect! July 3rd, every year, even! These look great. I always take mine off before exercising, for fear of losing or damaging. This would be a fantastic option. The hubs was talking about getting us these rings since he is the outdoors man who would rather not be wearing a metal ring...and I, the runner, would rather have something "less valuable" on my hand. Great giveaway! I have been looking at these for a while now and would love to try out a new sporty ring especially as racing season is right around the corner! My husband and I are constantly taking our rings off so we don't ding them or lose them (or in my case, knock the suspended rock out of it.) We both play soccer, he coaches soccer and basketball, I do PiYo and TRX and other things where I prefer to not have a 'restrictive' ring. 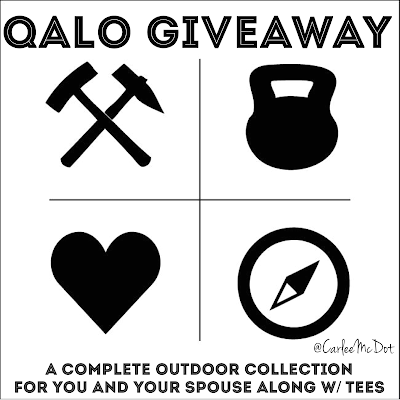 These would be a great alternative for us both and I've heard so many wonderful things about QALO rings. 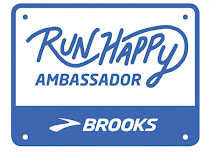 Whoops, entered before I finished -- our anniversary is 7.21.12. I love QALO! My husband wears his daily to workout and I unfortunately lost mine (it was in my bag) while traveling. Since starting to train, I have noticed that my fingers swell so I don't often wear my wedding rings. We'll celebrate 5 years on July 31st! My anniversary is January 10th. We just celebrated 12 fabulous years! Ill be celebrating 19 years of marriage on June 21st.